Lovin the whole wheat banana pancakes! >I have been eating pancakes since I was little. My Dad would make tiny, perfect pancakes and my Mom would make one large pancake the size of the pan. So my first foray into anything but homemade pancakes that taste better than they look was interesting. I went to breakfast a couple years ago at the Sunroom Cafe and got their whole wheat blueberry pancakes. To say the least, they were amazing. The second time I went I got whole wheat banana pancakes and they were better! And after getting my whole wheat banana pancake fix at the Sunroom Cafe for two years I decided I could make my own. I bought Aunt Jemima’s whole wheat pancake mix and had two ripe bananas (not sure if this would work as good with yellow bananas because they aren’t as soft but I am partial to really ripe bananas to start with so that’s what I decided to use). Basically all I did was mix the bananas (chopped into bite size pieces) into the whole wheat pancake mix and made the pancakes like normal. 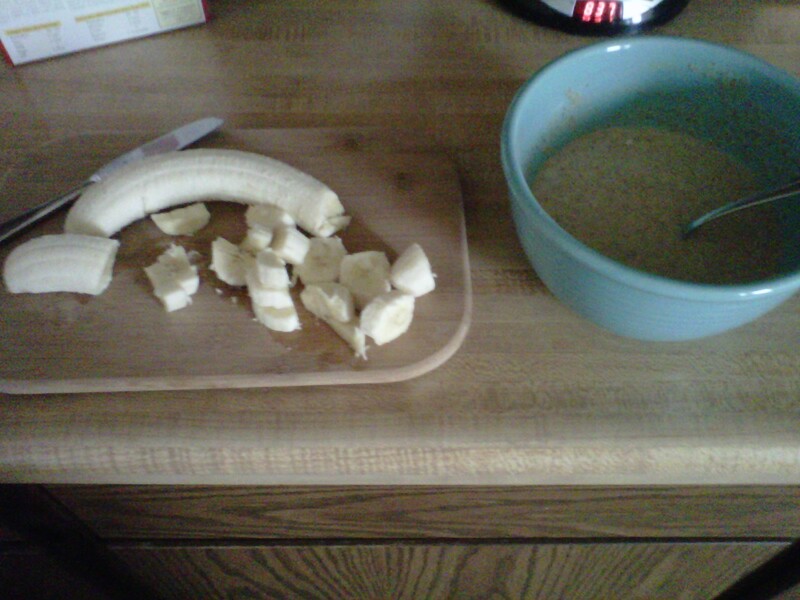 Then I added some slices of the remaining banana on top for a little extra texture! They turned out really good! 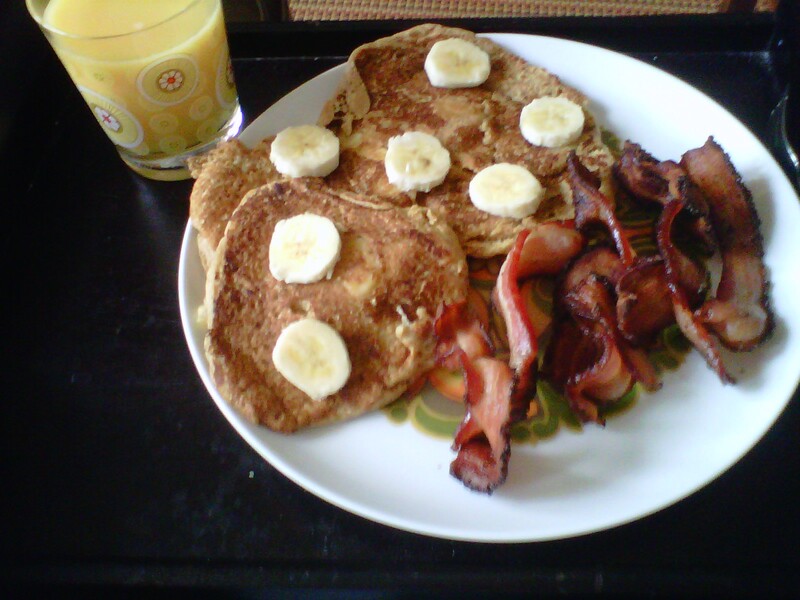 The combination of the nuttiness of the whole wheat pancakes and the fresh bananas was great! I barely used any syrup because the bananas were so flavorful on their own! I think the mark of good pancakes are ones you don’t have to drench in syrup. I ate my pancakes with pepper bacon (which I absolutely love and is from my uncle’s meat store, Hewitt’s Meat) and orange juice! It was a perfect start to a productive Sunday at home! I was shopping with a friend today and we decided to stop somewhere for lunch. We weren’t sure where we wanted to go so we just started driving around. 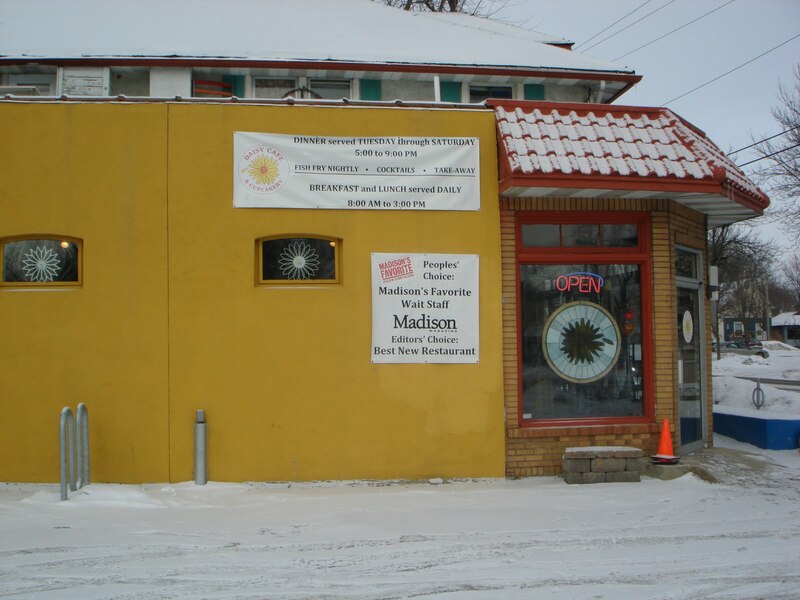 And a cute little cafe in downtown Middleton caught our eyes. It looked really eclectic from the outside except the fake flowers in the flower beds so we decided to go in. 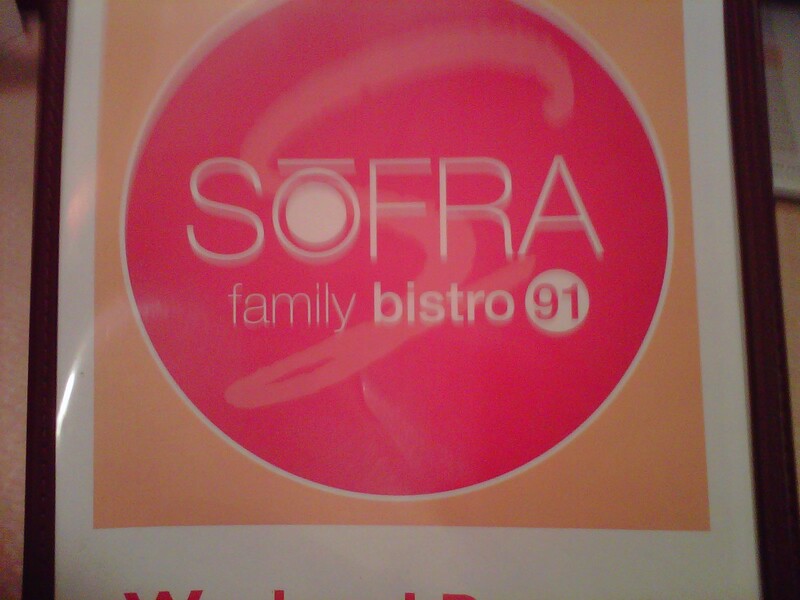 The sign on the door said “Sofra Family Bistro Mediterranean and American,” which was automatically apparent by brunch menu options that included gyros, eggs benedict and crepes. They had traditional breakfast and lunch options like omelets, salads, burgers and sandwiches but what caught out attention was the “cocktails” section of the menu. 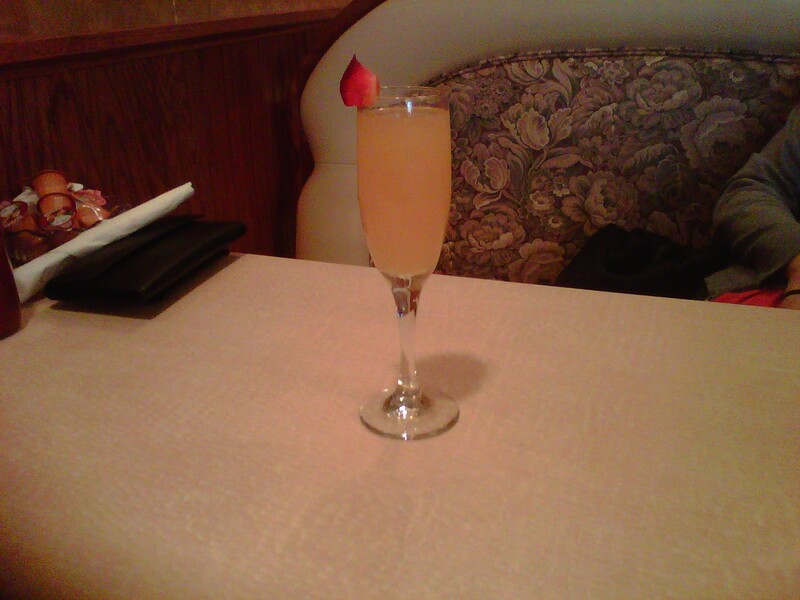 They had the regular mimosa and other similar sparkling drinks with flavors like peach or pomegranate. Peach Belini – after most of strawberry was already eaten! 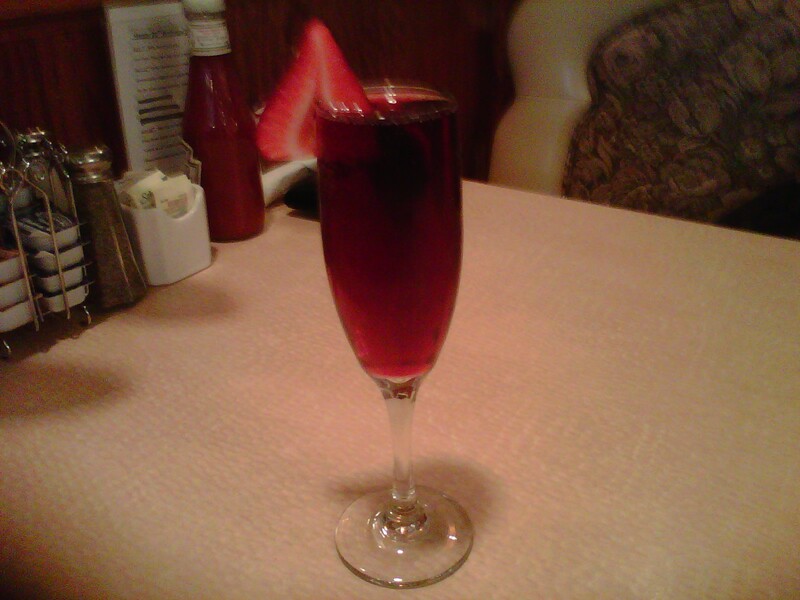 The drinks were a good balance of sweet flavors, champagne and liqueur. Both came with a strawberry garnish and were under $5. Though the brunch menu included some interesting sandwich options like a Salmon Club, Port-of-a-Bella and Reuben both of us opted for breakfast choices. 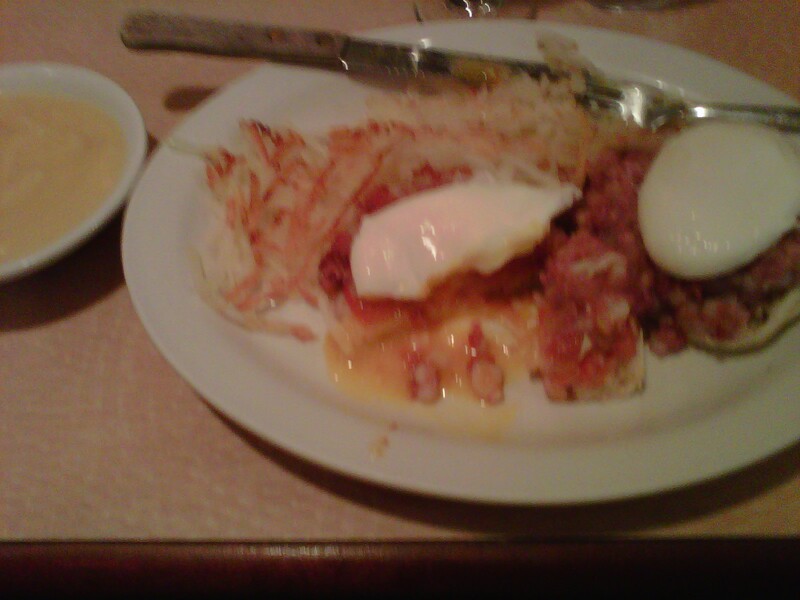 I got the Irish Eggs Benedict that has corned beef hash instead of a slice of Canadian bacon. The hash was not homemade and was pretty mushy, the eggs were cooked perfectly, the hash browns were unexceptional and I’m very glad I got the hollondaise sauce on the side because it was thick, luke warm and mostly flavorless. My friend got the Mediterranean scrambler that comes with spinach, tomato, mushrooms, zucchini, red roasted peppers, and feta cheese. 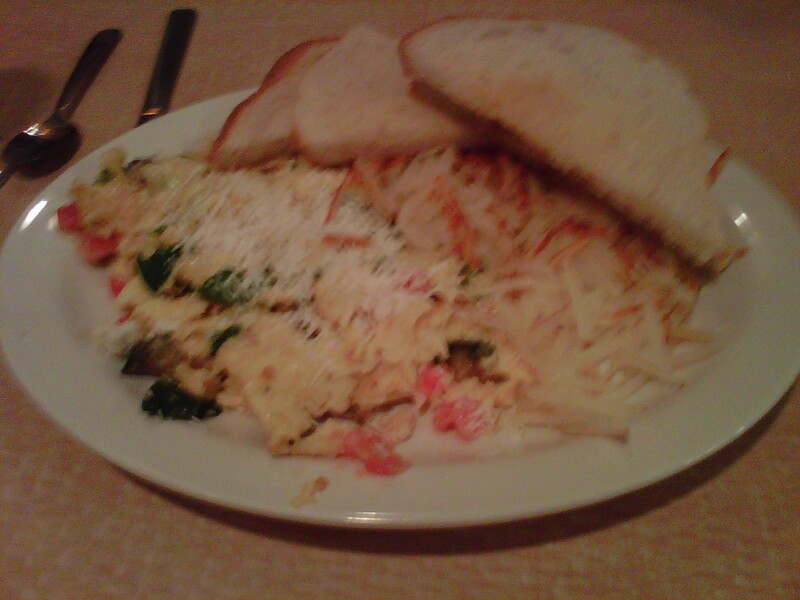 It looked pretty good but came with a ton of toast and looked like it had way more egg than scramble ingredients. I looked at their lunch and dinner menus online and they look more Mediterranean focused than the very traditionally American breakfast options. The decor was an interesting combination of eclectic colors and patterns, and grandma-style patterned booths and bad carpeting. Bottom Line: I want to go back for lunch or dinner first before I totally write this place off as a not-so-good-local cafe. Designer cupcakes are always an interesting conversation for me because I really enjoy cupcakes but get annoyed when I pay $2+ for a cupcake that doesn’t end up impressing me. Frost to cake ratio needs to be even (I am not the biggest fan of frosting but if fancy cupcake-frosting is done well I am a huge fan of it. So the frosting needs to flavorful and not over-the-top sugary). There should be a good mix of classic flavor choices and interesting options (I usually get a classic red velvet and something new and interesting!). The cupcakes NEED to be fresh. I have not been to too many cupcakeries or fancy bakeries but the few that I have been to seem to follow these guidelines pretty well. Daisy Cafe and Cupcakery on Atwood Avenue is very good about the guidelines! Their cake is always moist, fresh and usually an interesting flavor instead of just vanilla or chocolate. All of the frosting I have had from there is light and flavorful unless it is the cream cheese frosting which is amazingly rich and heavy (which cream cheese frosting needs to be to be good)! And their cupcake display case always (unless you’re too late and they already sold out!) has classics like red velvet and a traditional butter cream options. Their red velvet is fantastically traditional and well-done but I keep going back to try their new flavors. The first time I went I got a chocolate cupcake with mocha butter cream frosting. The cake was good but mixed with the delicately flavored mocha butter cream was exceptional (mind you, this was the only option left when we got there for dinner!). The second time I went I got a red velvet and cupcake made with a banana/pecan cake and topped with a chocolate/peanut butter butter cream frosting. This cupcake takes cupcake eating to another level. The cake is dense and moist with the pecans adding great texture. The frosting is light in texture but amazingly dense in flavor! The third time I went back for the banana/pecan/chocolate/peanut butter cupcake but they had already sold out of them so I got a more traditional vanilla cupcake with vanilla butter cream frosting, which was very flavorful and fresh but not as amazing as the specialty cupcake I went back for! 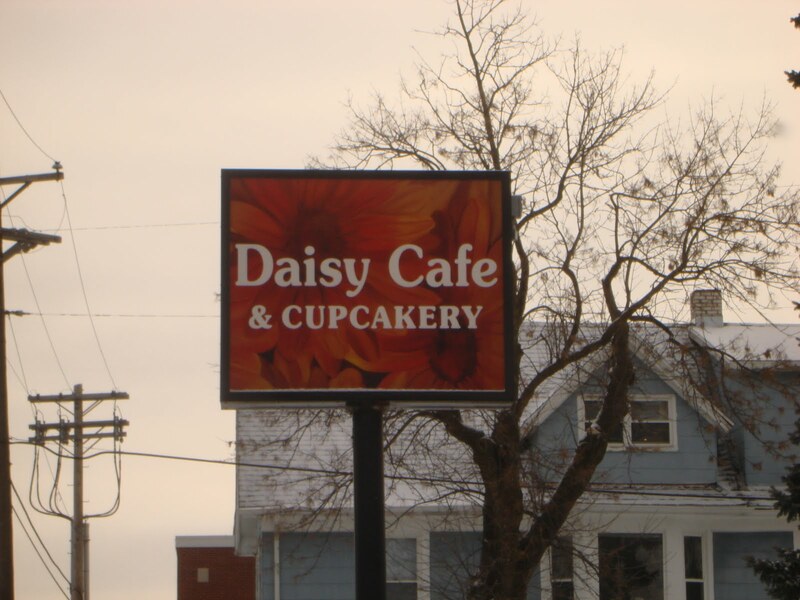 Daisy’s server more than just cupcakes. Now on to dinner. 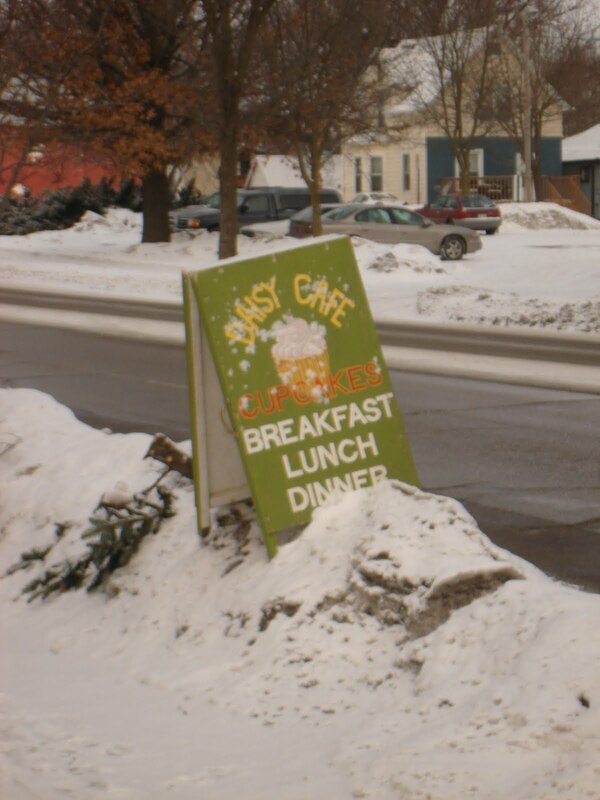 I haven’t had a chance to eat here for breakfast but plan to in the very near future because Daisy Cafe has been serving breakfast a lot longer than dinner and probably has it perfected! I went to dinner with a friend a little less than a year after they started serving dinner and we were shocked to be the only ones in the dining room at 5:30pm on a Thursday. But despite being the only diners we both really enjoyed our meal. I got traditional meatloaf and my friend got the chicken and bacon pasta. Both of us were pleasantly surprised with the amount of food we got for the prices and really enjoyed our dinners. My meatloaf was very flavorful and came with the traditional mashed potatoes and vegetables. The mashed potatoes went really well with the meatloaf just as tradition says but the vegetables were a surprising respite from the heaviness of the meal. My vegetables were perfectly sauteed and seasoned perfectly. 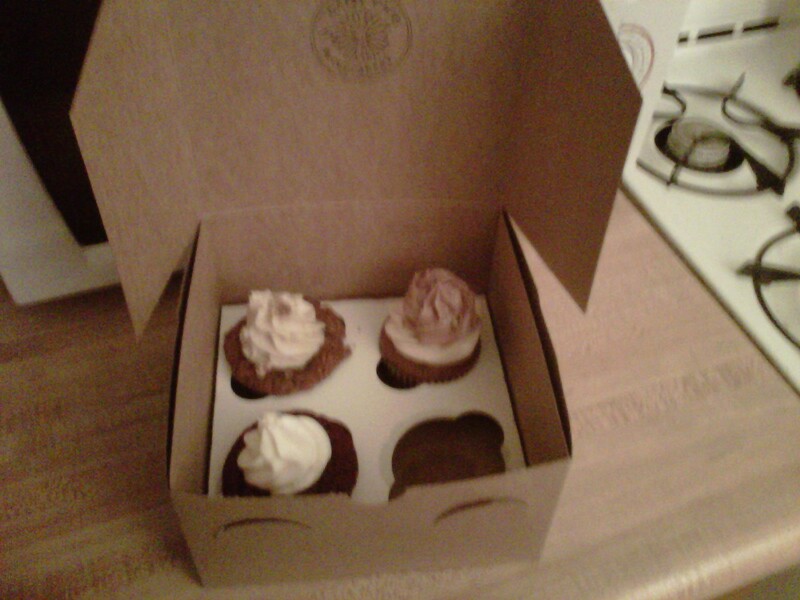 And even though both of us had to take part of our meal home we got a cupcake to go (the mocha one!). Bottom Line: the cupcakes are worth the $2.50 you pay for them, I will keep going back to see what new flavor they are making, their dinner menu offers a full range of options and I will be going back to try the multigrain pancakes or huevos rancheros de la Daisy. Navy bean soup without the navy beans? >Most people who know me know that I really love making things in my crock pot. I love the simplicity of throwing a bunch of ingredients in, turning it on, leaving for work or class, and coming back 8 hours later to a fully cooked, mostly homemade meal. A couple months ago I made split pea and ham soup in my crock pot, which I listed a smoked ham hock as an ingredient. Upon locating the smoked ham hocks in the grocery store I was shocked to find that I could only buy them in a pair instead of just one. So I bought the double pack and froze the second one. Then last week I opened my freezer for an ice cream sandwich and saw the extra ham hock. I decided to look up bean soup recipes that needed a ham hock so I could use it up. I found that there are a ton of ways to make bean soup so instead of buying a bunch of ingredients to make one of the recipes I combined and altered five recipes to match ingredients I already had. All of the recipes were variations on Navy Bean soup but I didn’t have navy beans so here’s my recipe. It turned out pretty well and I didn’t have to buy a single thing. If I would have to guess the total cost of all my ingredients bought separately I would say it was around $12 and I ate it lunch and/or dinner for a little over a week. 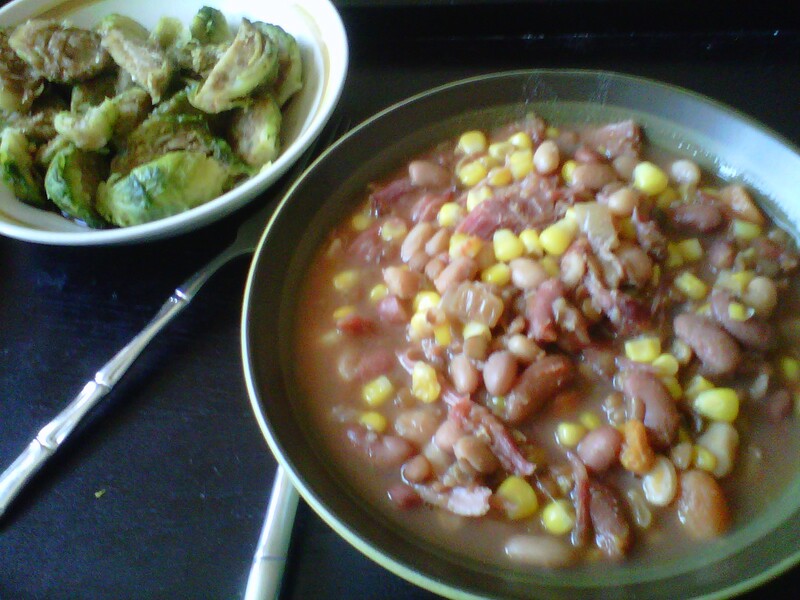 Bottom line: Bean soup recipes are very versatile in the crock pot. Don’t like carrots? Add beans or peas instead. Don’t like kidney beans or pinto beans? Add chickeas and black beans! I’ve also seen recipes were they use bacon instead of a ham hock which is good for people who don’t want to deal with the skin and fat that go along with using a ham hock. The best recipes are ones you alter to your preferences and keep updating every time you make it. 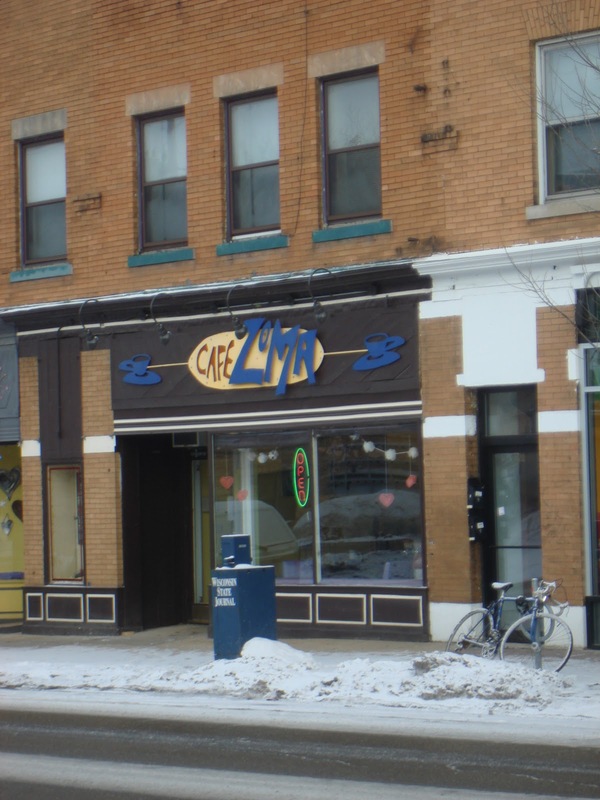 >At first glance Cafe Zoma on Atwood looks nothing like a chain coffee shop. The sign is colorful and eclectic, and the decor on the inside gets a helping hand from rotating artists. The walls were covered in elementary kids’ art on my first visit! The mix-and-match furniture and huge doors leading to the back patio (which according to “the locals” is used as the front door more often than the actual front door because it is right off the bike path!) give the room a great vibe and amazing natural light! The best part about this neighborhood cafe is that it is actually part of the local chain Espresso Royale, which means their drinks are familiar and their employees are well trained. The quality of their baked goods is great for a chain cafe and the quality of their coffee drinks is great for a cafe that feels so local! The staff were really nice and made a might strong mocha that kept me going the entire three hours I was there. They have a great mix of tables and comfy chairs so it’s great for a meeting, coffee date, homework or casual reading (which is what most of the people were doing when I was there!). They do have WiFi but the password isn’t posted anywhere so you have to ask the staff (hint: it is “goodcoffee”). The baked goods are pretty typical of a coffee shop: breads, muffins, scones, cookies. And the sandwiches, though pre-made, are very good. The turkey and avocado sandwich comes on wheat bread with avocado (of course! ), onions, tomatoes, lettuce, pepper jack cheese and a lot of turkey. For being a pre-made sandwich is was surprisingly fresh and one of the best cold turkey sandwiches I have had in quite awhile. I look forward to going back once it warms up outside to try their fresh-fruit smoothies (the raspberry one has honey in it!) and read on the back patio. Bottom Line: baked goods and atmosphere are like a neighborhood cafe; coffee and WiFi are great qualities of a chain cafe. >I am an anomaly when it comes to college students and preferred foods. Example: I absolutely love peas! I love cooked peas, raw peas, cold peas and peas in recipes. Sometimes, if a recipe doesn’t already have a vegetable in it I will toss a bag of frozen peas into it just for color! Oh yeah, this one I can blame on my mom, I love mixing a can of peas in with a box of mac and cheese. It is great! Seriously, you should try it! 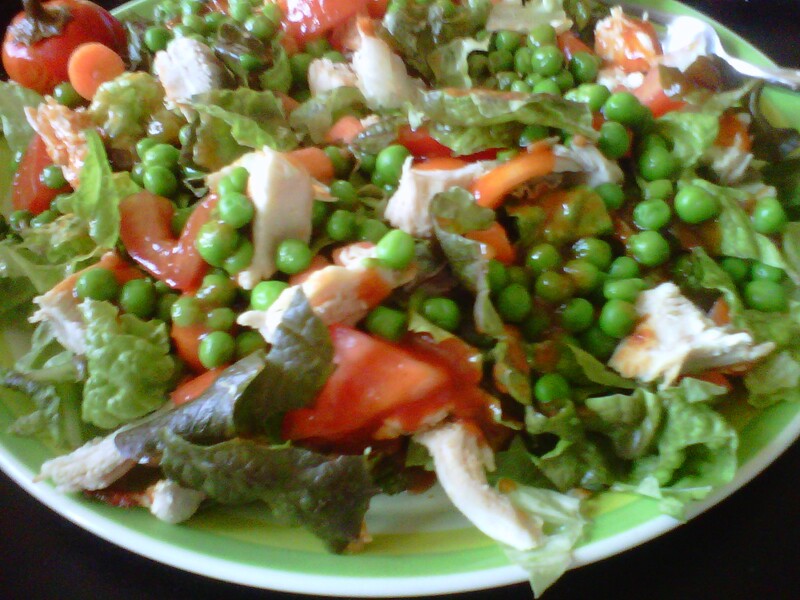 But one of the best ways to eat peas is cold and on top of a salad! It is so refreshing and adds great texture and nutrients! I recommend adding peas into your favorite crock pot recipe, pasta dish or even using peas to substitute ingredients to jazz up a traditional recipe. Try this recipe for green pea hummus. It is excitingly green and unexpectedly flavorful! Bottom Line: GIVE PEAS A CHANCE!! !